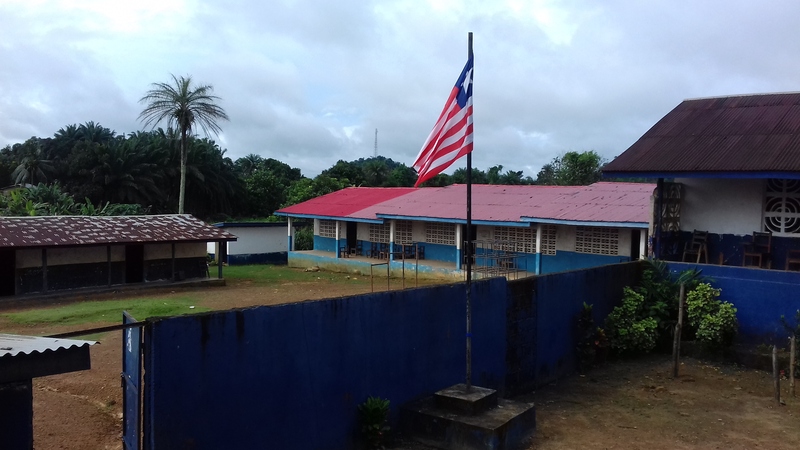 As an education volunteer, my main assignment in the Peace Corps is teaching at the local high school. I’m teaching math to the 10th and 11th graders. It’s hard to believe but I’m already more than 2 months into the school year! It’s my first year teaching and my first observation: teaching is hard work! 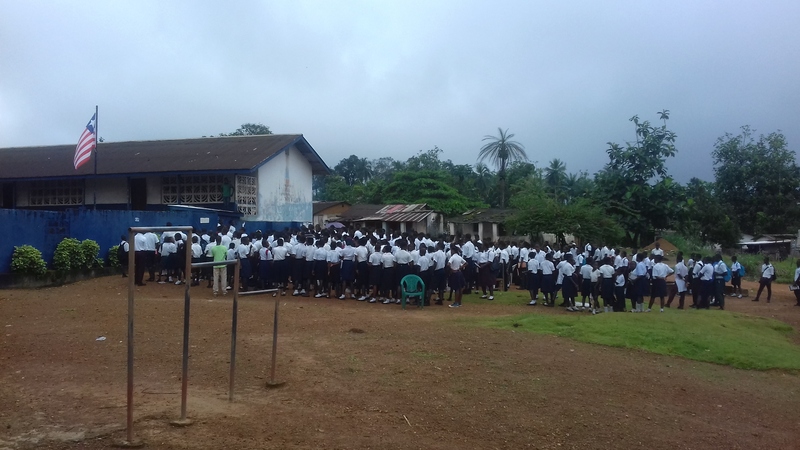 And teaching at my school here in Liberia presents its own challenges. 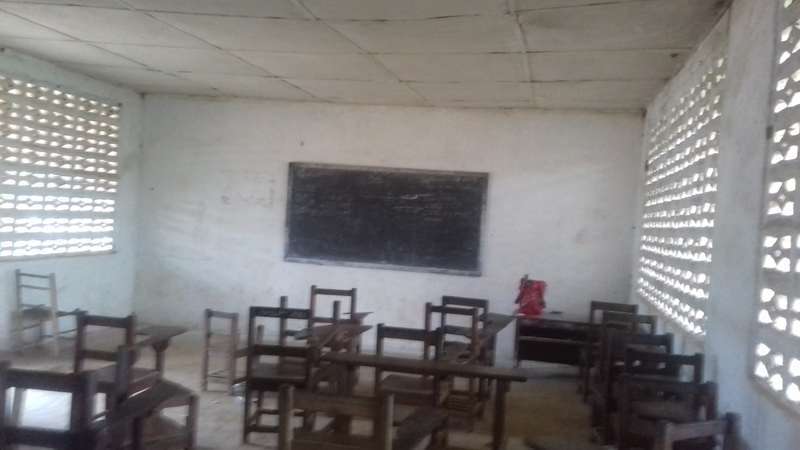 Like most places in my community, the school doesn’t have electricity, so there’s no smart board, no overhead projector, no computers or photocopiers, none of the things that you’d expect to find in an American school. Everyday we teach with chalk on a blackboard! 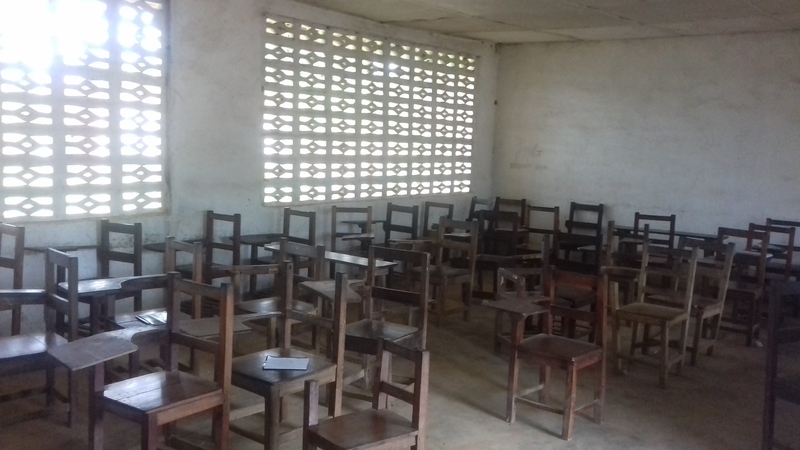 Even with the limited teaching resources, one of the more pressing needs at my school is something you wouldn’t encounter in schools in the US: there are not enough chairs for all the students. Every school day begins with devotion, where the students line up in the courtyard by class, to say the pledge of allegiance, sing the national anthem and hear any announcements from the principal. As soon as the students are released from devotion, it is like a stampede of students running to their classrooms to claim a chair before they’re all taken. Some students bring their own chairs from home, but even so, every class has at least a few students sharing chairs or a couple of students standing in the back. The school is working on the chair situation, already they’ve been able to bring some more chairs and are working with the community to fundraise to buy more. Another challenge at the school is getting textbooks in the hands of the students. We have a library with textbooks for most all of the different subjects and grade levels but when I first arrived a couple months ago they were all in boxes! The principal (who is also new to the school) had them all unpacked and put on shelves before the school year began. Now they are at least more physically accessible but there’s not an effective process for students to check them out. So besides a handful of students that come in to read or study during recess, the books are sitting unused. That poses a challenge for me as a teacher because it means the students only have the notes and practice problems that I provide to them on the blackboard; I can’t reference a reading from the book or assign homework from it. 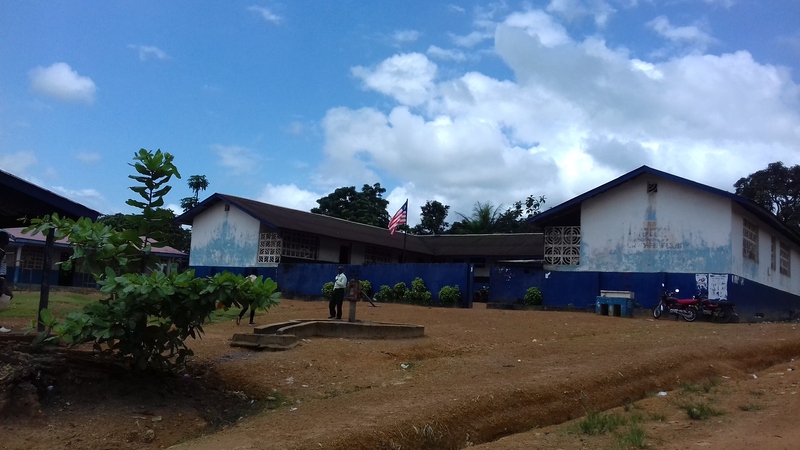 But when it comes to the library, the school is making progress “small small” as they say here in Liberia, a little bit at a time. Something that’s been hard for me has been the size of my classes. I have about 60 11th graders in only one section, in a classroom that fits 30 comfortably. And in 10th grade, I have nearly 100 students – luckily the school was able to split them into 2 sections, but still around 50 students per section. To me these feel like very large classes, but I’m actually middle of the range – some of my fellow volunteers have classes of 80 or even 100 in one section! But I’m learning how to manage so many students at once and figuring out what I can and can’t do with classes of this size. An additional challenge that comes with big classes is a wide variety of ability levels among my students. In my 10th and 11th grade classes, I have some very bright students who are right on track with their grade level, while others struggle with some of the basics, unable to do multiplication without a calculator or add negative numbers. This can make it tough to keep up with the curriculum and plan my lessons. I’ve found that the best way to accommodate majority of students is to incorporate quick reviews into my lessons as I’m teaching the curriculum – for instance, a short review on exponents before learning pythagorean theorem. One of the most frustrating things I’ve run into here is the “spying” or cheating! While there’s a “no spying” policy, it’s not really enforced so students have gotten used to being able to cheat – everything from turning around to look at each other’s papers, copying homework, talking or passing notes during tests, anything you can think of! They tell me that in Liberia, it’s good to “share ideas” during a test (though the principal will definitely tell you otherwise!). So I’ve been working to make it harder to spy – creating multiple versions of tests and quizzes and walking around during the test and marking their tests if I see any fishy activity. They like to joke about it – “Miss S can minus!” – but I’m hoping when they see how it impacts their grade they’ll stop doing it so much. And one last challenge teaching at my school here is that there are often things that come up that impact the school day – whether it’s arriving at school to find out there’s no classes because the students are spending the day cleaning up the campus or there’s an impromptu teacher meeting during recess that runs over so I lose half of my teaching time during the next period. I’m learning to expect the unexpected and to be flexible with my plans! Even though there are many challenges, I’m figuring out how to deal with them and learning a lot. I’m enjoying working with the students who are eager to learn and love to see students catch on to a concept that they struggled with at first. At two months in, I’m getting into the swing of things and continuing to learn and adapt as the school year goes on! 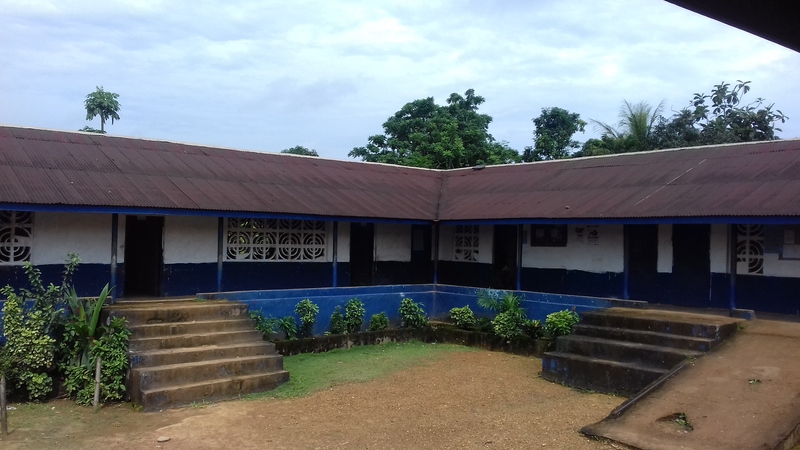 This entry was posted in Africa, Liberia, Peace Corps and tagged Africa, Liberia, Peace Corps, Peace Corps Liberia, school, teacher, teaching, West Africa. Bookmark the permalink. You are doing so well! Miss you, but so happy for you and what you are accomplishing!